It’s almost redundant to be writing this the day after I posted the diary of my run week. I want to be consistant in reporting my Kona build so I’m going back over now familiar ground. I’ll try to base this more on figures and analysis. Running dominated the week. I learnt a lot about my capacity to keep going and ways to approach big mileage. I was most surprised with how my legs seemed to get stronger day on day. Rather than tiring the constant moderate pace seemed manageable. The toughest aspect was the mental side of dragging myself back out there in the final days! The impact on my body was heavy. The weight loss that happened in the week was unexpected in size and more than I wanted. Sure I want to be close to my race weight, but even I’m aware I shouldn’t be dropping that much so quickly. No signs of serious problems though I’m clearly closer to my training limits than I have been. Keeping a balance on volume and intensity is important now too much will do me no good. Some of the niggles in leg muscles seemed to clear themselves up over the week. I did foam roller a couple of times and started wearing compression tights to bed. I was surprised that the compression seemed to help, I’d become sceptical about it, but am reconverted. I even started wearing my socks down at the lake. It did take the edge out of all the standing around! Fatigue built day on day. If you look at the hours in the table below you’ll notice I ended up biking and swimming a lot less. I honestly couldn’t find the energy for more! Cycling was mostly easy though I was pleased to throw in some solid, but shorter efforts in the second ride of the week. Motivation really struggled leading to the low hours elsewhere. I was tired and by the end if I’d not publicly had the target I’m not sure I’d have made the effort! The difference splitting runs up over the day makes was interesting. Comparing how I felt on Friday after running 36km over three runs with running 30km in one on Sunday is a revelation. The break down involved in a single big run is so much more significant and I felt the soreness on Monday. It emphasises how the long run has its place you can rack up volume without it, but there’s some specific benefits to be gained from it. I built myself to a new all time high level of Chronic Training Load (CTL) or fitness for running. 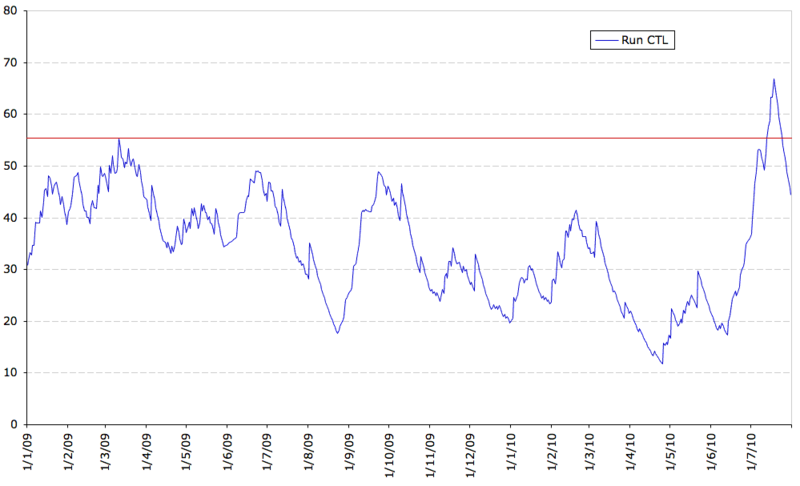 As the above chart from WKO+ demonstrates I’ve no held such a high CTL since the start of 2009. This is a great place to be as I start to move my run training from largely just volume to a more focussed series of sessions. It’s a good sign that I can handle a high training load of running and should hopefully be able to avoid injury. This is the first time I’ve had a week where the contribution of Training Stress Score (TSS) from my different activities came mainly from running. Cycling contributed a paltry 355 points to this week’s TSS whilst running accounted for 945 points. What’s worth noting there is whilst my weekly hours were lower than usual my TSS for the week was largely the same. How compatible TSS from running and biking actually are is another question. I certainly think that 945 TSS of even easy running is far more strenuous on the body than achieved via cycling (assuming comparable intensities). They’ll always be something of a disconnect here so whilst it’s nice to see consistency in the figures, individual sport’s TSS seems more important to me. The most obvious bad is how heavily all this running cut into my work load in the other sports. I watched the bike CTL (fitness) I’d built in the last two or three weeks ebb away. Ultimately this had to be accepted I’d made the decision to focus on the run and was reaping the rewards in terms of training load there. As ever it’s easy to plan heavy training loads all round, but much harder to execute. Keeping the balance whilst progressing all three sports is part of the challenge of triathlon training. It also has to be said my attempts to go swimming were terrible last week. I’m not sure if I can really blame fatigue for this either. Largely I lacked the motivation to get to my time slots efficiently. When your local pool is as warm as a bath it’s not very alluring either! Having been spoilt in La Santa it’s a shock to the system to be back. I don’t think I lost much in the time as the few short sessions I did were good quality, but with ambitions to improve in Kona I need to be working here. I can’t let weight loss go unmentioned. If you tracked the weight at the end of each diary entry you’ll have noted I lost 3Kg over the week! That’s ridiculously high. 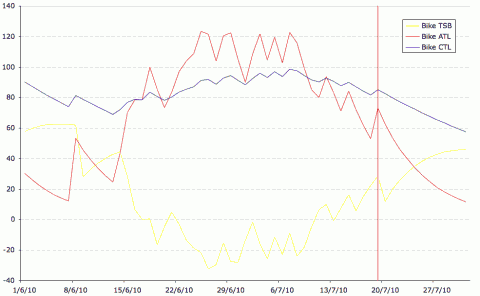 I’ve added the chart of weight loss for the last few weeks which I think adds some reality to that process. Firstly be aware that I lost 1.5Kg of that total weight loss overnight on the last day. I had some stomach issues after all. 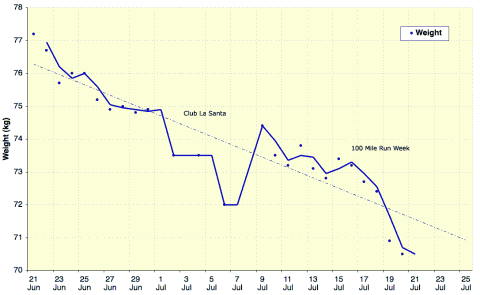 I suspect my weight after La Santa and in the lead in to the week was coming in a little high. 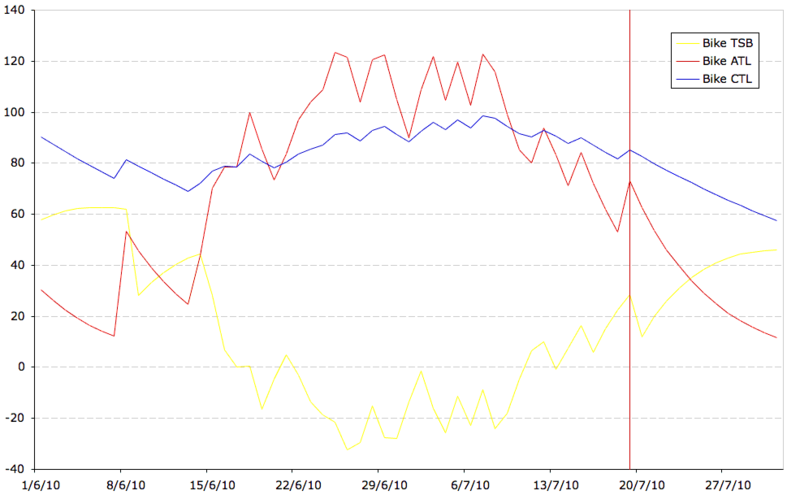 I’d been feeling bloated for most of the period after La Santa and you can see it fluctuates at a higher level than I recorded over in Lanzarote. I have a friend who insists he can never go to La Santa without coming back with some kind of fluid retention that takes a week to clear. Whether that was affecting me I can’t say. I’m counting the rapid loss as a bad though as I don’t want it falling at this rate. It may have placed me at my target weight for the ITU Long Distance Worlds and I may be very close to Kona weight, but I wanted a bit more control getting there. Big running weeks create quite a hunger I can tell you and my meals have been massive. I do have a food diary for the week and may publish that if there’s interest. The run focus has been a very positive experience, not just this last week, but those leading up to it. It’s helped to transform my running from something I was getting through to something I’m enjoying again. I’m well placed to really make some in roads into my performance now and with two months to Kona I’ve plenty of time. It’ll be interesting how this volume translates into performance in the ITU Long Distance Worlds, I think they may be too close to benefit fully. Cycling has ticked a long maintaining a reasonably high level, but it’s time to restore some balance and start working here. The plan for the next week or two sees me focussing more effort into the bike and keeping the run at a high, but reasonable volume. The aim it to bring the bike CTL up to around the 100 level before Worlds. 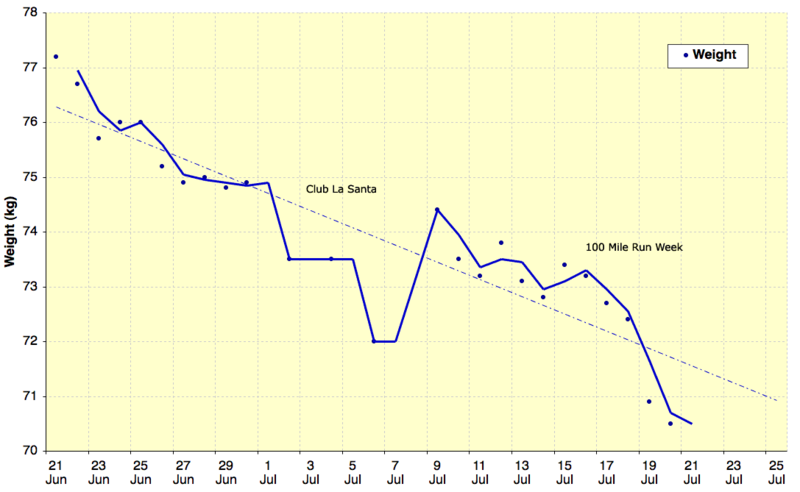 A mini-taper/recovery cycle will make a dent, but then it’s about getting to a peak for Kona. I’m cruising too much in the pool at the moment. 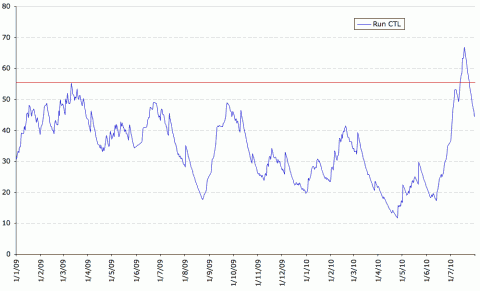 Letting my swimming tick over, but not working hard enough to gain speed here. It’s time to maintain a more serious volume of effort which I know helps me a lot. The other key is to ensure two good quality pool sessions a week working on developing my threshold pace. I have to remember I want to be looking at the hour for Kona this year. I’m a little disappointed that I couldn’t have made a more rounded and balanced week of training. I realise now that I didn’t fully appreciate the toll running would take and how tough it could be. I’m glad to be returning to a regular routine and mixing things up. Hopefully I can start to reap the rewards in my running and see improvements elsewhere.